The Philippines has several kick@$$ entries in the Guinness Book of World Records, the most prominent of which is the utterly b@d@$$ Ferdinand Marcos as the greatest thief of all time and his equally b@d@$$ wife, Imelda Marcos, with the biggest shoe collection in the world. The exact number of the shoes varies anywhere between 3,000 to 8,000 pairs but that doesn’t really f@#$*n’ matter does it? The minute you can go for a full year without wearing the same shoe twice is effin’ excessive. Now, much as it is utterly appalling to be known for this insane thievery spree, you have to admit that these mothereffers took thievery, human injustice, social climbing and wealth hoarding to whole new level of sh!t. The bar is so high, angels can rest their legs on it. Ferdinand Emmanuel Edralin Marcos started his criminal life early. His father, Don Mariano Marcos was an assemblyman and representative of Ilocos Norte. In 1935, Ferdinand Marcos was 18, his father lost to his political enemy, Julio Nalundasan in the local elections. Shortly after the declaration of victory, Nalundasan was shot dead. Marcos, along with his father and two uncles, were arrested and charged with murder of Julio Nalundasan in 1938. Marcos, who just got his Bachelor’s degree in Law was forced to study in prison. That didn’t stop him from getting marks so high, he was summoned by the university dean on suspicion of cheating. If he could, wait for the word, allegedly murder his father’s political rival what are the chances the dean winning over him? He walked out of the dean’s office with the dean as his b!@tch. He was not allowed to take an oath yet, though, pending his murder trial. Luck was about to b!tchslap him as he was found guilty by the Laoag Provincial Court and sentenced to rot in jail. Marcos had other plans. In a true b@d@$$ fashion, Marcos defended himself before the Supreme Court and got acquitted. If winning a case even before you actually become a lawyer doesn’t earn you respect, I don’t know what will. He was subsequently hailed by Philippine Free Press as the Lawyer of the Year. That was pretty sweet, eh? Not for Marcos so he decided to join the World War II and be a Prisoner of War. He survived the Death March and joined the guerrillas in Luzon. Or not. Even American documents couldn’t confirm his story. Not that it matters to Marcos, the only thing that matters is that he claimed it. Anyone who is not down with it will be subsequently perished from his existence in this world. Marcos resume law practice in 1946 and even became the youngest member of the House of Representative at 32. Now, even with women, he has it his way. He married an extremely beautiful Imelda Romualdes after only eleven days of knowing each other. You have to understand that this 1954, Pinays were culturally bound to stretch the courtship period to lengths longer than the waiting period of the next Transformers movie. He got her in eleven days. Yes, you read that right. The Shake Rattle and Roll movie is on theaters longer than that. Water services to eight regions and 38 localities. In 1966, more than 100 important smugglers were arrested; in three years 1966-1968 the arrests totaled 5,000. Military men involved in smuggling were forced to retire. American culture was so dominant at that time. Filipino artists were forced to become copycats of Foreign artists. Marcos wasn’t feelin’ it so he imposed a 70/30 rule on radio stations. Each station was to play Filipino songs 70% of the time. Hello OPM! He also felt it was about time that people become aware of current events so he blocked off the 6pm primetime slot as the news hour. People were going to watch the news until their eyeballs come off. He was big on agricultural innovation too. He looked at the country and realized our soil is epic. That should produce more rice than what we need so he promoted this mothereffin’ IR-8 hybrid rice. I don’t know what monster that is, sounds like the brother of R2D2 to me but whatever it was, it made us self-sufficient in rice, the first time in history since the American period. In addition, the Philippines exported rice worth US$7 million. Marcos initiated, together with the other four heads of state of Southeast Asia (Indonesia, Malaysia, Thailand and Singapore), the formation of a regional organization to combat the communist threat in the region – the Association of Southeast Asian Nations (ASEAN), an organization that was later on revealed to be his brainchild. He wanted to use this as his jumping point to conquering the whole of Asia. Take that Hitler! He was re-elected, the first time ever a Philippine President was re-elected. Now, the downside of being too brilliant is that you can also be fu$%!n brilliant with evilness and Marcos played the part perfectly. In a true rock star fashion, he made the military his bi@!tch. Like a killer whale that was put on vegan diet for a decade, he went on a frenzy on the first taste of fresh meat. He put up a mining business. Yeah, a mining business. He, with his wife, rode the helicopter and looked at properties that they like. Once they are feelin’ it, they just say “that’s mine” and lo and behold, it becomes theirs. They pulled businesses down to the ground by simply not supporting them or inventing some case to force them to close or by just getting it from them. He was not about to take sh!t from anyone. You say one thing against him and you will lose your ability to say anything at all. Maybe your family too if he woke up at the wrong side of the bed. He also opened a bank account… in Switzerland and since he didn’t have any source of income, he took the money off the Philippines instead and put it under someone’s name that was subsequently transferred to someone else then was moved somewhere else and converted to something else by someone else… ah f%ck it. Point is, he was so brilliant in hiding the money, even the bank can’t find it. The international economy decided to join in the fun of neckstomping the Philippines to absolute poverty. Oil-producing countries decided to cut back on oil production just because they f@#$in’ can. Well, not exactly. They got pissed at the US when the US decided to help Israel in the Arab-Israeli conflict. Don’t you just love the US?! Oil price shoot up and the Philippines, having its money taken away, were now giving up their arms, legs, liver, and effin’ eyeballs for a kilogram of rice. Students started feeling massive discomfort so they rebelled. 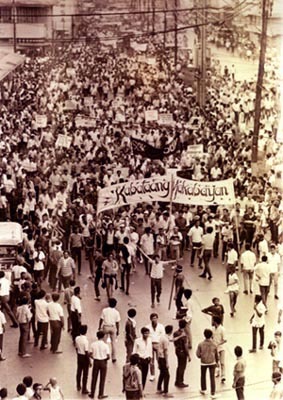 Marcos, as we have established, was not going to take any sh!t from anyone even if it meant killing four students in the first massive demonstration back in 1970 known as the First Quarter Storm. 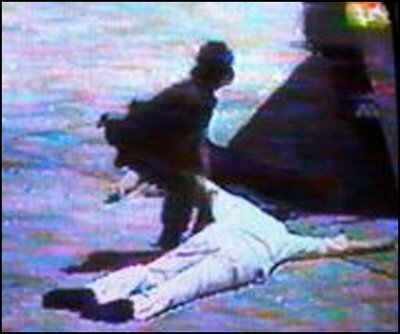 Students started launching rallies left right and center and Marcos started killing, arresting, torturing, people left right and center. Now, some b@ll$ this guy got as he decided to seek for a third term. Problem is that the law wouldn’t allow him so he bribed people to change the law. Problem solved. On September 21, 1972, Marcos signed Proclamation No. 1081 placing the entire nation under martial law. He got six years in the office with no limit on the number of times he can go for a re-election. 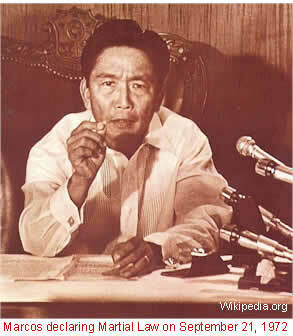 He mandated himself to continue his presidency under the period of martial law. He lifted martial law in 1981 and run for re-election against Alejo Santos. He also decided to silence his archnemesis, Ninoy Aquino by assassinating him during the live coverage of Ninoy’s arrival to the Philippines after years of exile. Yeah, kill your archnemesis while the whole world is watching, why the h3ll not? Like a true blue b@d@$$, Marcos never did anything half baked, right? That wouldn’t make any sense. You want to be a lawyer, you become the best or f$%k off. You want to become rich, you become so freakin’ rich, the tenth generation of your family should never have to work again. You want to become the President, you stay there ‘till your dying days. What the Marcos did to this country, for better or for worse, is still being felt today. Hey, we’ve got OPM music, we owe him that but we are also poor, he’s got a lot to do with that. He has been dead for how many decades and his actions are still being felt today. Whether we admit it or not, the Philippines remains his b! @tch to this day.